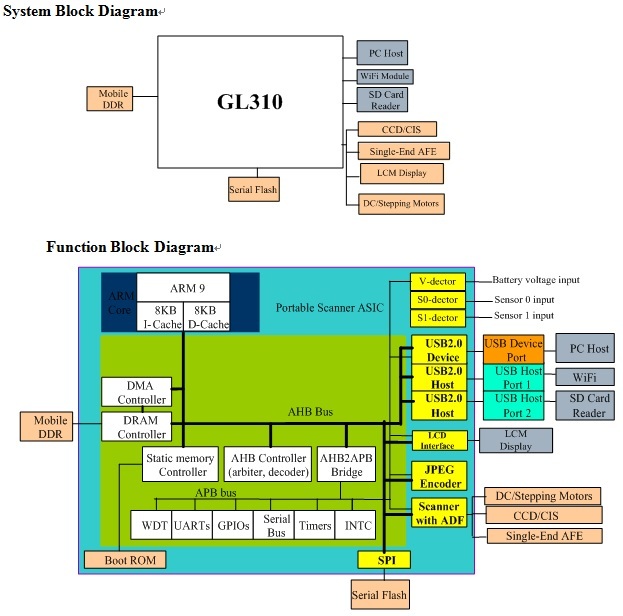 Genesys Logic's single-chip GL310 is a high speed, high performance, low cost and rich scalability controller for standalone scanner. It is designed for bus-powered, portable or fast sheet-fed scanner controller. It successfully integrates ARM9 CPU, scanner function ASIC, JPEG encoder USB2.0 device and USB2.0 hosts controller into one single-chip. With its high performance design architecture, GL310 is ready for supporting CIS or CCD image sensors (600~9600dpi resolution) that are used in ADF sheet-fed and DC motor scanner.